Working with forklifts can be a dangerous job, and not just because of the sheer size and weight of the forklifts themselves. There are many different components involved with operating a forklift, and one of the most common being refueling a forklift before daily tasks. Although simple, refueling is one of the most dangerous maintenance jobs because a single mistake can lead to serious consequences. What are the Hazards Involved with Gas Refueling? The number one and most dangerous hazard associated with gas refueling is the risk of fire. If the fueling is being done in an enclosed area and even a little bit of gasoline is spilled, all it takes is for one tiny spark or open flame to ignite and cause an explosion and wide-spread fire. Recently, three warehouse workers were performing routine daily tasks and caused a serious fire when one worker was refueling a forklift. With the warehouse doors closed and a portable heater nearby, the worker refueling dropped the gasoline can and spilled fuel on the floor after he was surprised by another worker. The workers ran outside before the spilled gasoline made its way over to the heater, but another worker made the fire worse when he sprayed water onto the flames. The fire grew too large for a fire extinguisher, and the workers ran further and were only 20 yards away when flames roared out of the warehouse window. The three workers survived unharmed but caused hundreds of thousands of dollars in equipment damage. 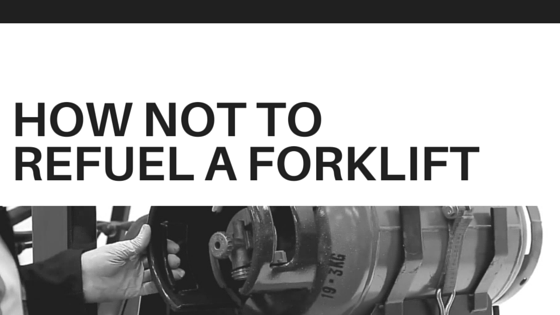 What are the DON’T’S of Forklift Refueling? What are the DO’s of Forklift Refueling? For the three workers in the story, they were very lucky to have survived the accident without injury. But most workers in this situation would not have been so lucky and chances are, lives would have been lost. Make sure you and your employees are prepared for situations like this with a forklift certification.